Natural phenomena consist of simultaneously occurring transport processes and chemical reactions. These processes may interact with each other and lead to instabilities, fluctuations, and evolutionary systems. This book explores the unifying role of thermodynamics in natural phenomena. 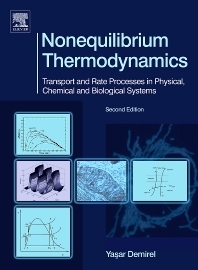 Nonequilibrium Thermodynamics, Second Edition analyzes the transport processes of energy, mass, and momentum transfer processes, as well as chemical reactions. It considers various processes occurring simultaneously, and provides students with more realistic analysis and modeling by accounting possible interactions between them. This second edition updates and expands on the first edition by focusing on the balance equations of mass, momentum, energy, and entropy together with the Gibbs equation for coupled processes of physical, chemical, and biological systems. Every chapter contains examples and practical problems to be solved. This book will be effective in senior and graduate education in chemical, mechanical, systems, biomedical, tissue, biological, and biological systems engineering, as well as physical, biophysical, biological, chemical, and biochemical sciences. Dr. Yasar Demirel earned his PhD degree in Chemical Engineering from the University of Birmingham, UK in 1981. He joined the faculty of Çukurova University in Adana, Turkey, and promoted to associate professorship in 1986. In 1993, he joined the faculty of King Fahd University of Petroleum and Minerals in Dhahran Saudi Arabia where he was promoted to full professorship in 2000. He carried out research and scholarly work at the University of Delaware between 1999 and 2001. He worked at Virginia Tech in Blacksburg as a visiting professor between 2002 and 2006. Currently, he is on the faculty of University of Nebraska, Lincoln. He has accumulated broad teaching and research experience over the years in diverse fields of engineering. He is the editor-in-chief of the International Journal of Thermodynamics. Dr. Demirel authored and co-authored three books, four book chapters, and 160 research papers. The first edition of Nonequilibrium Thermodynamics was published in 2002. After it was expanded to a graduate textbook, the third edition was published in 2014. The second edition new book titled “Energy: Production, Conversion, Storage, Conservation, and Coupling” is published in 2016. He has obtained several awards and scholarships, and presented invited seminars.